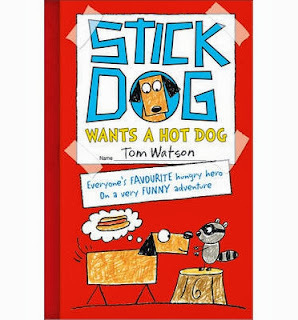 Stick Dog Wants a Hotdog is the brand new children's book from Tom Watson, published by Harper Collins. It is the second in the Stick Dog series which tells the story of Stick Dog and his gang of four friends, and fellow dogs - Mutt, Stripes, Karen and Poo-Poo. I was really surprised by the book, we haven't seen the first in the Stick Dog series and, rather than a straightforward, printed novel the book looks like a hand written notebook, with lots of little drawings which accompany the text. This makes for an interesting, innovative way of telling the story. It's quite reminiscent of the Diary of a Wimpy Kid series and, with this in mind, I passed the book to my nephew who is a huge fan of the Wimpy Kid books. My nephew tells me that the book describes how Stick Dog and his friends want hot dogs, but it isn't that simple. The dogs end up going on a wild adventure encompassing helicopter flying, trying to get the better of a raccoon named Phyllis and outwitting humans. He really enjoyed the book and said that he loved the different adventures that the Stick Dog and his friends go on. The drawings were great and really helped to tell the story well. My nephew is ten and he did say that he thought it was a little young for him in places. He says he would have liked it more when he was seven or eight. All in all, he really did enjoy the book and said it was a funny, quick and easy read. Having looked at the book myself, I'm quite taken with the illustrations. I know that, when I was a child, I would have loved how well illustrated the book is and the funny little cartoons really made me smile. I actually found myself reading through the book, just to see if the five dogs achieved their aim. It is a really engaging read. Stick Dog Wants a Hotdog, by Tom Watson, is out now and available from all good bookshops. I have one copy of Stick Dog Wants a Hotdog to give away to a lucky reader. To enter, please complete the Rafflecopter widget below, and remember to read the terms and conditions.